The first legacy space ‘for an institution outside of the Habib institutions’, called the Standard Chartered Classroom, was inaugurated at the Habib University Campus in Karachi on Thursday, January 21. 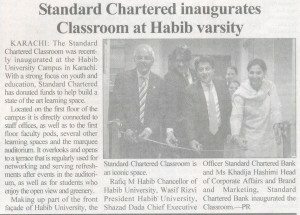 Standard Chartered’s gift to Habib University has made a considerable contribution towards higher education by creating a learning space located on the first floor of the campus, directly connected to staff offices, as well as to the first floor faculty pods, several other learning spaces and the marquee auditorium. 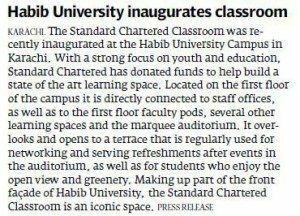 It overlooks and opens to a terrace that is regularly used for networking and serving refreshments after events in the auditorium, as well as for students who enjoy the open view and greenery. Making up part of the front façade of HU, the Standard Chartered Classroom is an iconic space. It has been used mainly for classes of the School of Arts, Humanities and Social Sciences (AHSS), including Mathematics for Social Science, as well as of the Liberal Core, such as Rhetoric and Communication. Recently, a first-of-its-kind workshop by Stanford University’s Design School was held here with HU’s internationally qualified faculty. 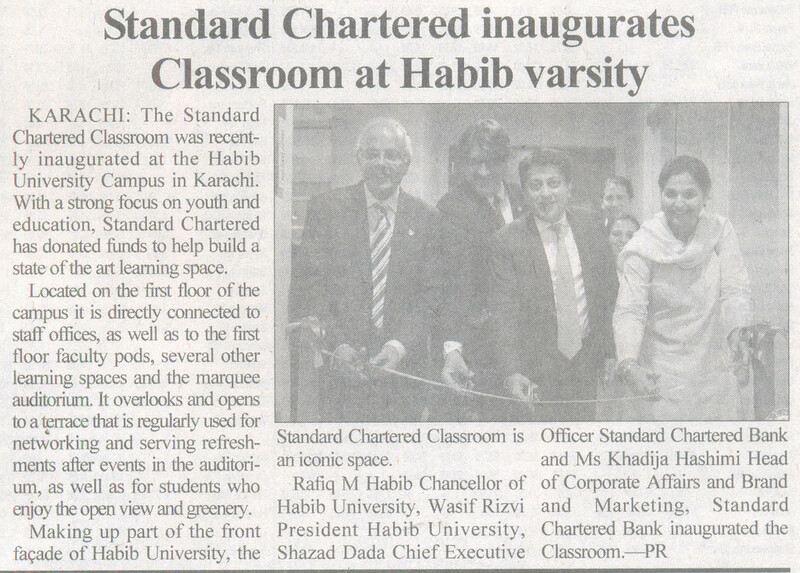 Finally, Mr. Shazad Dada, CEO of Standard Chartered Bank (Pakistan) Ltd, was given a token of appreciation from Habib University, following which he addressed the ceremony saying that the deep rooted relationship would go many more years.